Shaw’s “Pygmalion” takes a similar approach to perspective. What’s the difference between high and low class? Are certain people superior by birth, by income, by education? These issues still resonate in England, where having the wrong accent can mean the difference between success and failure, and are increasingly relevant in America, where cries of “class warfare” filled the last election cycle. In “Pygmalion,” Shaw skewers perceptions of class by highlighting one of its most prominent features: manners. Shaw seems to be asking: What’s the point of class distinctions when there are so many more empirical ways of measuring a person’s character? You probably know the story. 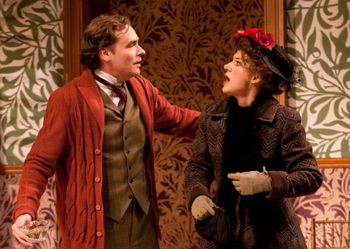 Linguist Henry Higgins (Robert Sean Leonard) meets cockney flower girl Eliza Doolittle (Charlotte Parry). After some discussion, and a wager with erudite colleague Colonel Pickering (Paxton Whitehead), Higgins consents to teach Doolittle to speak and act properly. The ultimate goal is to pass her off as upper class. While Pickering exhibits an altruistic noblesse oblige towards Doolittle, Higgins sees her as a lab rat on which he can test his theories. At an even more visceral level, the sound of her voice simply hurts him. He would blot out her accent as if it were a piece of graffiti. Leonard’s Henry Higgins is intelligent, profane, impatient, and perhaps most importantly, emotionally lazy. Eliza is a poor ignorant flower girl and always will be. He rolls his eyes, laughs mockingly and even feigns the vapors. He is an agent of change who resists it in himself. However, despite the arrogance, we can’t help but like him. The interactions between Higgins, Pickering and Doolittle are brilliant. Whitehead seems born to play Pickering, whose impeccable manners and wry humor offset Higgins’ temperamental boorishness. These two get most of the laughs, but Parry owns the show. Eliza Doolittle is not one character but three, as she metamorphoses from duckling to swan. Parry nails all these transitions. But it gets better. As new characters are introduced, they add fullness to the production. Mr. Doolittle (Don Sparks), Eliza’s father, brings a curious blend of ethics and roguery. It’s a testament to Sparks’ abilities that the audience applauded when he returned in Act V. Mrs. Higgins (Kandis Chappell), Henry’s mother, is equally delightful. She is alternately compassionate and biting with equal aplomb. Nicholas Martin’s direction is perfectly pitched, but with a cast like this, it would be hard to go wrong. Special kudos to the Globe for set design and costumes, which beautifully capture the elegance of Edwardian England. Great show. I think they got it.